This video of a four-legged robot called "LittleDog" is fascinating and not a little creepy. If it had some fur it might seem like more of a "little dog" and less of an under-the-bed nightmare robot.The little fella is impressive in solving real-time terrain problems. He probably can't catch a tennis ball like my dog Jackie but eventually will have other useful skills for a battlefield near you (developed at USC under DARPA funding). I know this is just advertising, but it's really cool. In the new WIRED magazine, Olympus had an ad for a new digital camera called the PEN E-PL1. A nice, advanced little camera from the description, but the intriguing thing was the life-size cardboard cutout of the camera stuck to the ad. The ad's text promised an "augmented reality" demo of the camera using the cardboard cutout, a web cam, and a web site (plus a plug-in you need to install). I decided to try it, and it works - it's very cool, but still limited. 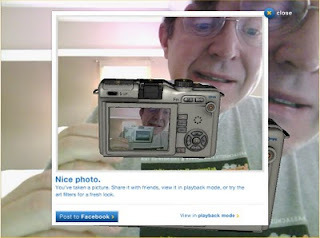 If the cardboard camera is in the web cam's field of view, their software recognizes this and replaces the cutout in the web cam scene with a 3D virtual model of the camera which features working buttons. The buttons are a bit awkward to use (holding the cardboard cutout in front of the web cam with one hand, clicking buttons with the other). You can rotate the cardboard cutout over a limited range and the VR version follows you. 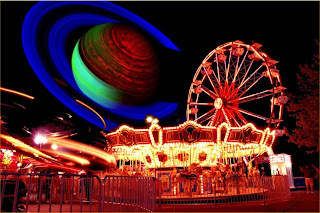 You can even take pictures and modify them in various ways that are supported by the real camera. It's awkward but it sure is clever. If it were on a nice, large touch screen like the (ahem) Apple iPad, it would be a lot cooler since you could press the buttons right on screen (as I tried to do anyway on the PC screen, silly me). That's silly me in the GEB-like self-referential scene above. 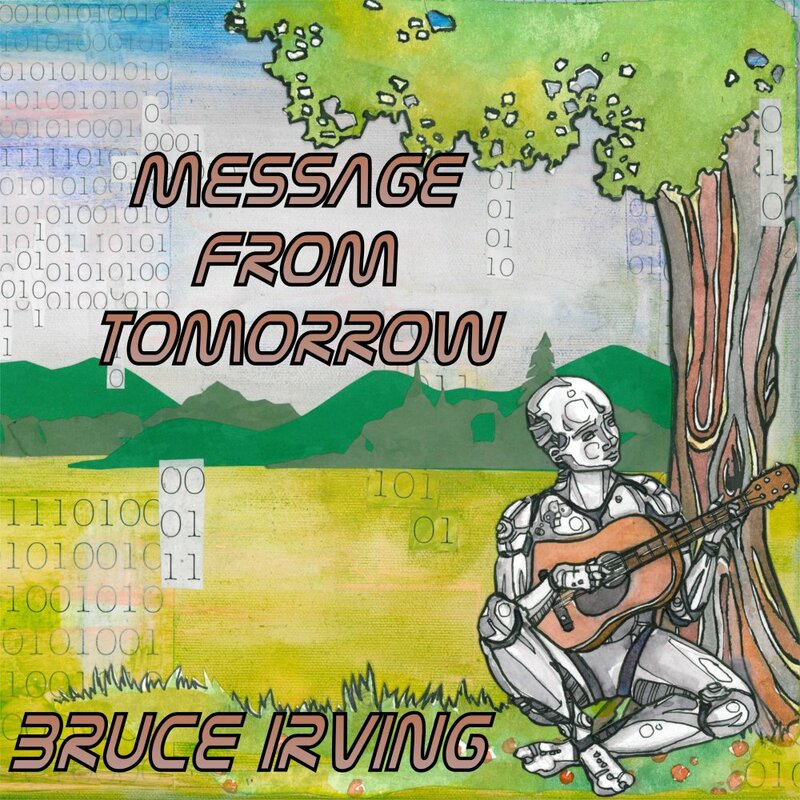 I'm still pretty much in music mode, having received the first 100 copies of my new album "Message from Tomorrow" on Friday. So I've been working on getting the album into CD Baby's hands for digital and CD distribution. This should happen pretty soon. 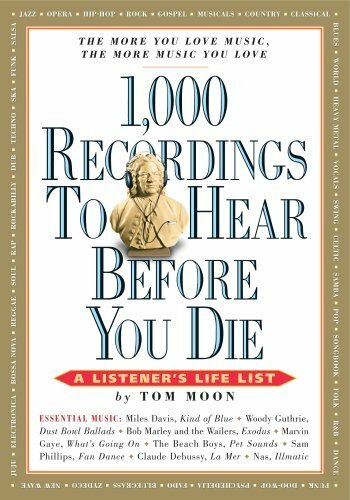 In the meantime, as if I don't have enough music on my brain already, I've been spending time browsing in the book 1,000 Recordings to Hear Before You Die by Tom Moon. The list is crazily diverse and very interesting. I find that I already have nearly all the pop and rock recordings (mostly albums) he suggests, as well as many of the classical pieces (though usually not by the artist he suggests). But even if I have the CD's and have already ripped them, I haven't necessarily paid close attention to all of these recordings before (at least not for a long time), so I'm finding gems in my own collection. Where I'm weak is in jazz and in world music. In spite of what I call my "completeness obsession," I'm not taking the author literally, and I plan to take my time. I've enjoyed some world music (especially Indian), and I'm open to the possibility of being blown away by some African artist I've never heard of. And although I like a lot of "jazzy" pop and rock music, I've never had a great affinity for straight jazz. So I'm taking it slow, but I think this book will help me expand my musical horizons in several directions. 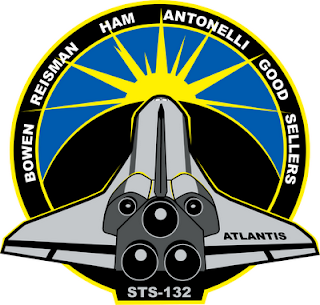 Thanks to NASA TV, I watched Atlantis launch on its final mission this afternoon at 2:20 pm EDT (STS-132). Great launch. 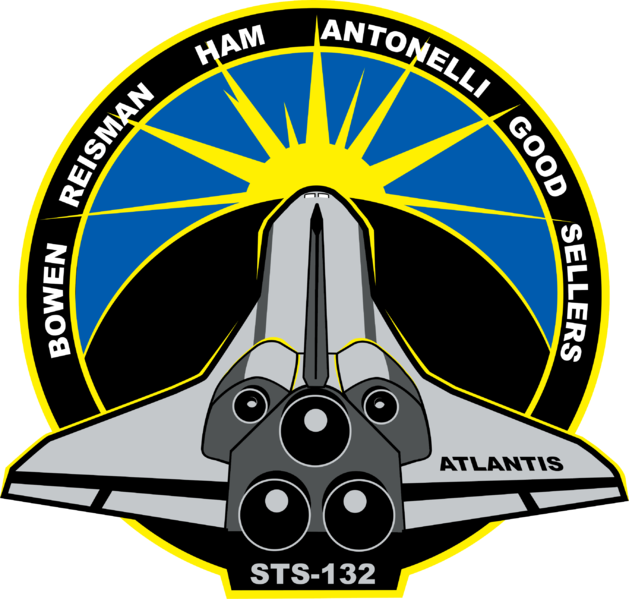 It's hard to believe there are only two more planned shuttle launches this year - and forever. It's a bit sad to see the end of an era like this. I can't remember when I first read Eric Drexler's 1986 book Engines of Creation: The Coming Era of Nanotechnology. Probably in the early 90's. I remember being really impressed with the book, which outlines the possibilities (and risks) of precision manufacturing at the scale of individual molecules. It never seemed that far-fetched to me, since every living thing on this planet is a proof of concept of molecular machines building other molecular machines such as marigolds, whales, and human beings. With massive parallelism, you can start with a single cell and grow a small human in about nine months. I didn't think it would be easy, but whether it would take 20 years or 100 years, it seemed pretty clear that if DNA and RNA and other molecular level machines in cells could build precise and complex machines (e.g., us), humans could eventually figure out how to do this too. Physics doesn't rule it out, and there's plenty of room at the bottom, as Richard Feynman pointed out in 1959. Of course we have lots of "nanotechnology" these days - but sunscreen and microfiber cleaning cloths are not what Drexler had in mind in Engines. He was talking about molecular manufacturing, and he specifically talked about nanorobotic "assemblers" that could replicate themselves. He later backed away from that idea as necessary for efficient molecular manufacturing, but not before the idea of self-replicating nanobots running amok and turning everything into "gray goo" had taken hold in the popular imagination. Although progress was made, the misconceptions really limited nanotechnology development for a few years (for more on this, see Drexler's "Letter from the Author" at the start of the 2006 "2.0" edition of Engines, which you can read online for free, or purchase a PDF for 99 cents here). In the last few years, the panic has subsided, and super tiny things have really started to move. Case in point: this Technology Review article, based on a new paper in Nature. The title and subtitle give the general idea: "DNA Robots on the Move: Machines made of DNA could one day assemble complex--and tiny--electrical and mechanical devices." Whoa. There are many astronomy web sites and planetarium apps, but this one is really different. Chromoscope shows you the sky in a wide range of wavelengths, from gamma rays to visible to microwaves. It superimposes and registers imagery from various sky surveys and provides a handy slider to change between spectral ranges (the picture here shows an area around Gemini in transition from visible to hydrogen-alpha). You can zoom and pan with the mouse, and there are also keyboard shortcuts (press H for help). It runs directly in your browser, nothing to install (it doesn't seem to use Flash - I tried it on Safari on the iPod Touch, and it loads so it's probably not Flash, but the controls don't really work). Thanks to Idle Diffractions for the tip. But there's also a free iPhone/iPod Touch app (Planets) that uses the data from this site to show the sky in different wavelength bands. It's called "Planets" but it actually shows the whole night sky, not just planet data. My new "2009" album is really almost done. Fourteen songs recorded mostly in 2009 (a couple started in 2003, and a couple done this year). 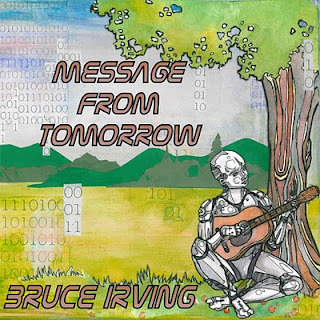 I've got the cover graphics done (painting by Monique Bonneau) and uploaded to CD Baby and I'm just waiting on slight corrections for two songs on the master disk. Then I can upload the master tracks and place the CD order. So with luck I will have a bunch of CD's in a few weeks, with MP3's for download on CD Baby even sooner (digital downloads on iTunes and Amazon will take a few weeks more to process). In the meantime, I've uploaded the final version of the title track as a download-only single, and it's available now on CD Baby and on iTunes. Plans for the world tour have not been started yet, but here are the lyrics for the song. You can also hear the song on MySpace Music. 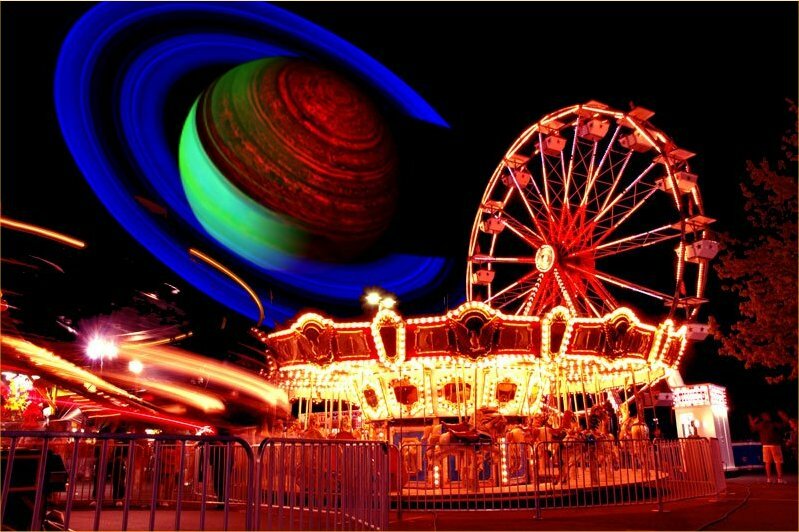 The Martian Chronicles is hosting this week's Carnival of Space. I saw part of this Canadian documentary on an airline flight last November, and I have wanted to find some way to see the whole thing since then, but it's pretty hard to find. The Musical Brain was supposedly available at this CTV site, but early this year it was blacked out due to some issue with broadcast rights to the Winter Olympics (not sure why they had to black out all news content for that). That was supposed to end on March 1 but it's still blacked out. I finally found it on YouTube in six parts (part 2 is missing), but it may not be there for long. It's worth seeking out. It's a really interesting documentary based in large part on the excellent book This is Your Brain on Music by Daniel Leviton. Leviton is a former professional musician and producer who pursued a neuroscience degree and who now studies how music works in the brain (among other things). He had always wanted to do brain imaging studies on a master musician, and he managed to sign up Sting for this. Much of the program involves discussions with and about Sting and his approach to music, with some discussion about his (fMRI) brain scan results. The actual scan results don't reveal any great insights to the viewer or to Sting himself - things like the fact that his brain "lights up" equally in response to jazz, rock, or classical music but very little for "muzak" - these are things that Sting already knew about himself. It was noted that when listening to or composing music, Sting's brain showed a lot of activity on both the right and left sides, which had not been seen in similar exercises with non-musicians or amateur musicians. It's not all about Sting. There's also good information on how babies respond to music, on the role that music has in the brain's development, and on the various roles that music plays in culture and in social situations.